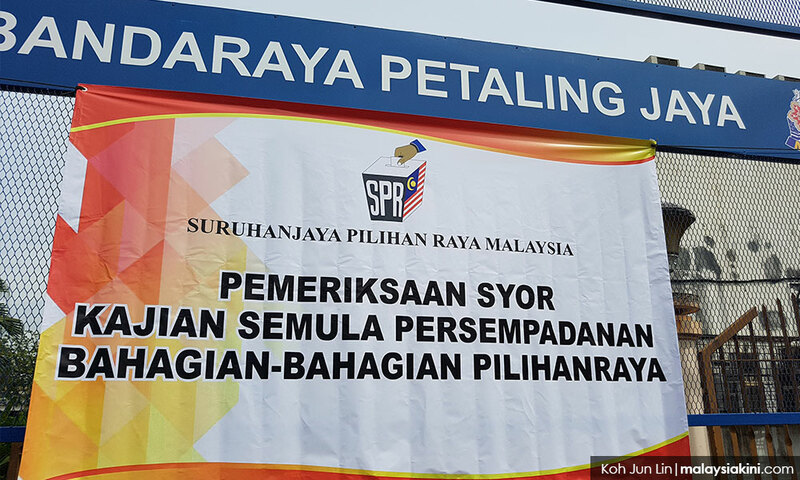 COMMENT | I will start with an obvious conclusion – if the current redelineation proposal by the Election Commission is passed in the upcoming Parliament session, it will unfairly swing 10-15 parliamentary seats in favour of BN in the upcoming general election. Here, I will not provide an in-depth analysis on the impact of the redelineation. Rather, I will highlight the current status of the redelineation process, and why it is important for Selangor voters to submit their objections now. At this juncture, however, suffice it to say that the EC continues to gerrymander and sustain malapportionment in the current redelineation exercise, and they are adamant on getting it passed before the upcoming general election. This is the common conclusion reached by several researchers and institutes in the past year. It is thus unsurprising that Malaysia ranked last of 161 countries studied in the acclaimed Electoral Integrity Project in the District Boundaries sub-category, with a miserable score of 10 index points. The upcoming GE14 will be a competitive one – and the redelineation exercise could very well be the difference between winning, losing, or gaining a two-thirds majority in Parliament for both sides of the divide. Under the Federal Constitution, the EC is obliged to publish the new electoral boundaries for public inspection. Voters can then submit objections within 30 days, and local inquiries must thereafter be held by the EC for each objection received. The EC can then make further changes and they must repeat the process once more. In other words, the EC must conduct at least two rounds of public display and local inquiries. 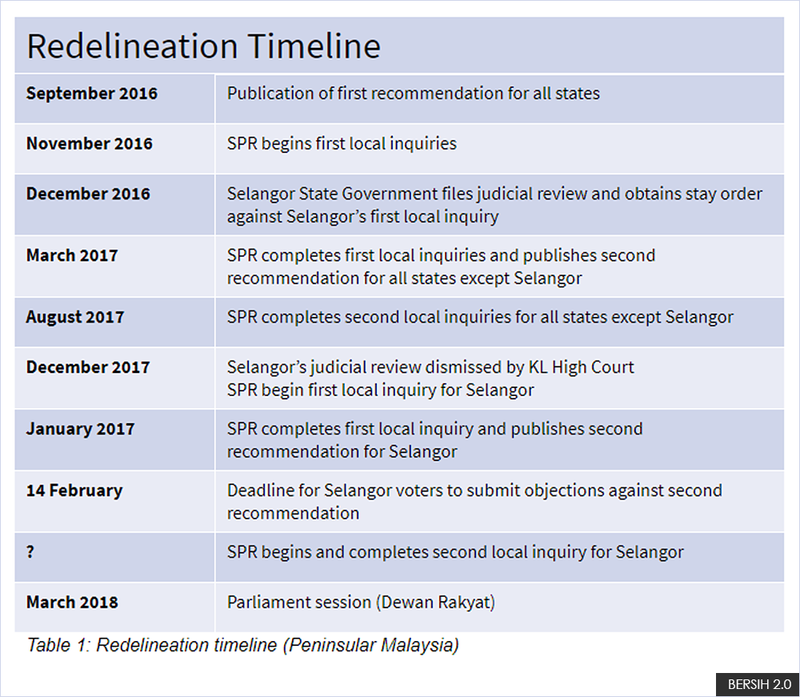 The EC started the redelineation process for Peninsular Malaysia in September 2016. The first and second public displays, objections, and local inquiries have been completed in 2017 for all states, except Selangor. This is because the state government filed a judicial review during the first display, arguing that it was unconstitutional because of, among others, malapportionment and gerrymandering. A stay order was also granted by the Kuala Lumpur High Court, which prevented the EC from proceeding with the first local inquiry for Selangor until the case is fully disposed. The Selangor case was unfortunately dismissed in December 2017. The EC wasted no time by immediately calling for the first local inquiry for Selangor during the festive period. With unprecedented efficiency, they then published the second display on Jan 15, less than a week after completing the first local inquiry. This means that Selangor voters now have until Feb 14 to file objections against the redelineation. In the first redelineation recommendation, the EC proposed immense changes that worsened the malapportionment and gerrymandering. In the second recommendation, the EC reversed most of the changes to status quo, i.e., maintained most of the existing boundaries. For example, in the first recommendation, P106 Petaling Jaya Utara was to be renamed P106 Damansara with an increase in the number of voters from 84,456 voters to 150,439. This proposal was reversed in the second recommendation, and P106 Petaling Jaya Utara was maintained. Similar trends were also observed in several states. This means that voters were successful in objecting towards the changes in the first recommendation. However, does this also mean that all is now safe and proper? In particular, does this mean that Selangor voters need not file further objections against the second recommendation? On the contrary, Selangor voters must still object to the second recommendation due to several reasons. Firstly, the existing boundaries are still marred by malapportionment and gerrymandering. As an example, the voter size difference between the largest state constituency (N29 Seri Serdang - 74,563 voters) and the smallest (N01 Sungai Air Tawar – 15,033 voters) in Selangor is 5:1. This is clearly in violation of the Federal Constitution, which states that the number of voters in constituencies must be “approximately equal.” How could the EC justify that 5:1 is approximately equal? Secondly, the purpose of redelineation is for the EC to take into consideration changes in demographics over time – for example, new residential areas – and make changes to electoral boundaries to ensure that they comply with the constitution. The last redelineation was done in 2002. Demographics surely must have changed significantly since then. If no corrections are made now, we will have to wait for at least another eight years (possibly two general elections) before another redelineation exercise can begin. The fact that the EC is not correcting existing malapportionment means that they are either lazy, or have something up their sleeves. The third reason why objections must still be filed is that the EC can still make further changes after the second recommendation. The absence of strong counter-objections against malapportionment and gerrymandering, therefore, will allow the EC a free hand to make further changes as they like. Worse still, the Selangor BN chairperson Noh Omar announced that they will be submitting objections. There is no doubt that these objections from BN would include unconstitutional recommendations to provide them with unfair political advantages. 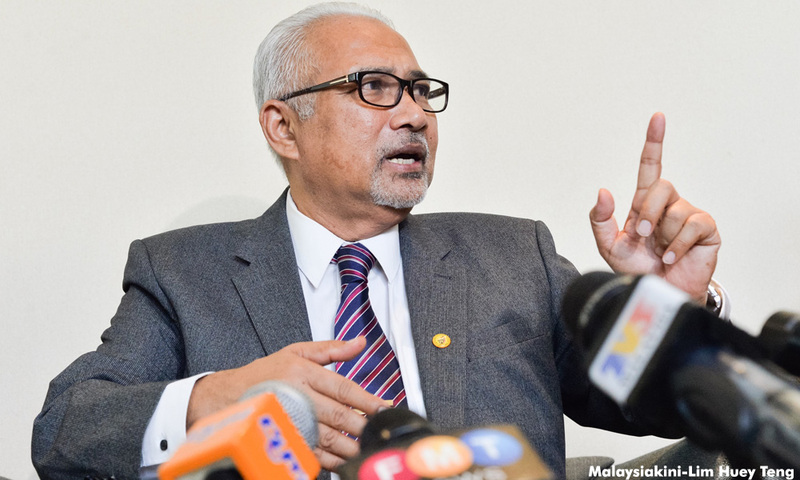 The EC could simply adopt Noh’s recommendations. After all, the present EC chairperson Hashim Abdullah (photo) has had close links with Umno ministers. The battle against unconstitutional redelineation has been a long and arduous one. The Dart campaign was launched by Bersih and Engage four years ago, in Feb 2014. The nationwide campaign brought together citizens – activists, lawyers, academics, ordinary voters, etc – with a common goal of stopping electoral manipulation via redelineation. In the past four years, the team has worked hard in researching and strategising on the issue. This includes doing what the EC has failed to do – providing digital maps and user-friendly information to voters. Over 100 training and briefings were conducted across Malaysia. This has resulted in over 1,000 objections being filed in the first recommendation itself, compared to the 300 odd objections filed in the 2002 redelineation. In the courts, at least 18 known cases were filed against the EC on this issue. The EC has had its way to redelineate as they liked for the past five decades. But now for the first time in history, the EC is faced with a strong resistance from the people. However, the Selangor second display and local inquiries are all that’s left for EC to do. The final proposal – for the whole of Peninsular Malaysia – will then be submitted to the prime minister, who can single-handedly make further changes before tabling it in Parliament. The next parliamentary session is from March 5 to April 5, 2018, and this is why the EC is fast-tracking everything. Selangor is, therefore, the last bastion against malapportionment and gerrymandering for the whole of Peninsular Malaysia. 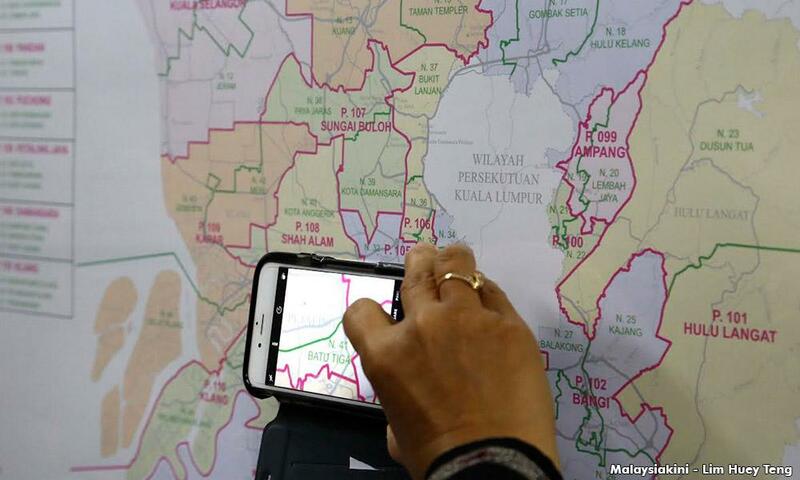 As a matter of immediate urgency, voters in Selangor must sign up as objectors to the second redelineation. As mentioned, this is needed to ensure that the EC corrects existing malapportionment and gerrymandering, and not worsen it. 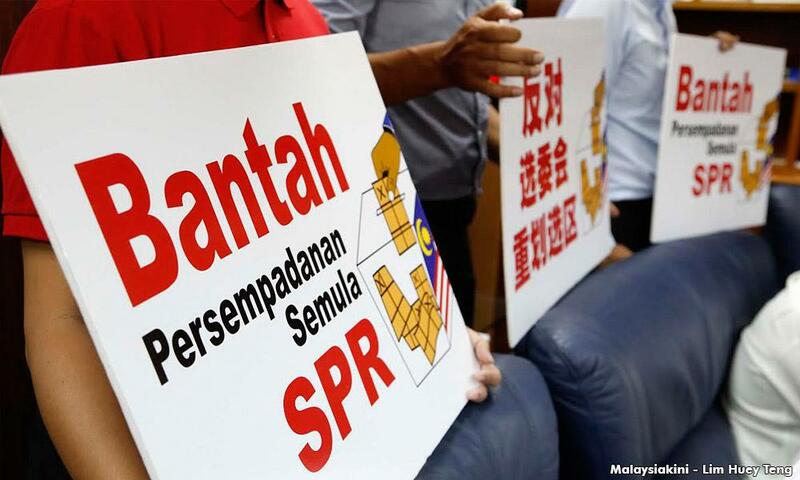 Bersih has called for 100,000 voters in Selangor to come forward for this purpose. This means that 1,000 objections will be filed to the EC, as one set of objection consist of a group of 100 voters or more in a constituency. 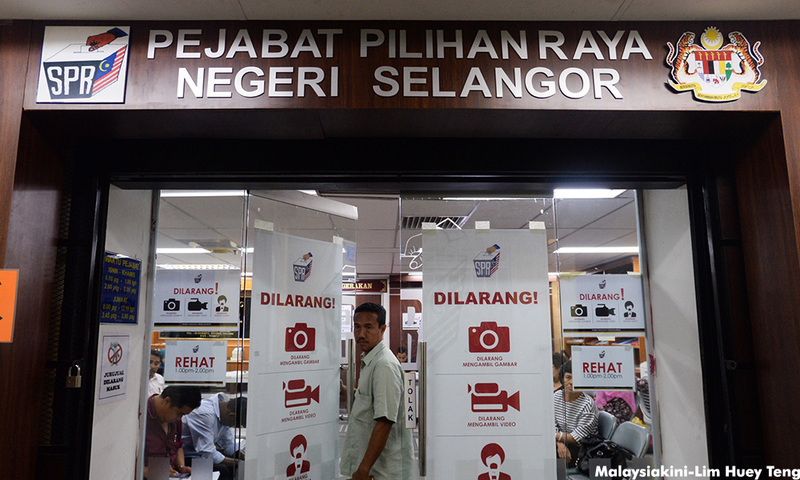 Selangor voters can visit one of the objection collection centres around Selangor to sign the objection. Objections to the centres must be submitted by Feb 10 to allow adequate time for us to compile and submit the objections to the EC before the Feb 14 deadline. While many Malaysians are presently debating ferociously on the issue of #UndiRosak or #UndiBaikBaik, perhaps we should all shift our focus for the next 10 days to the other vital issue for GE14 – the redelineation. CHAN TSU CHONG is the outreach officer of Bersih. Feedback, questions on redelineation, or suggestion of a witty boilerplate for future articles can be sent to [email protected] or @tsuchong.